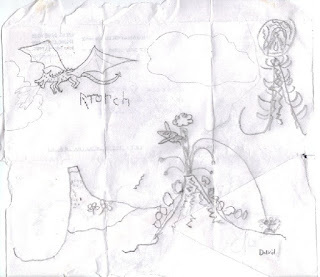 This drawing was done by my son (except for the dragon--he asked me to draw that for him). Do you see the plane crashing into the spewing lava? The mountain with flowers? The spiky tower? What better use for the inside of a once rejection-filled return envelope? Wow ... that's a perfect use for one of those once-rejection-letter-filled envelopes! :-) Your son is quite the artist ... and so are you (he must get it from you!) ... that's an impressive dragon! Thanks Kelly! I'll pass your compliment on to my little guy!